Arianna Occhipinti is a bit of a burgeoning rock star in the natural wine industry. The wines she crafts in Vittoria, Sicily, in the island’s southeastern corner, are bold and pure, nothing like the sharp, ripe reds often known in the U.S. from Sicily. From Albanello and Moscato di Alessandria grapes, the SP68 Bianco arrives as a bright golden hue, cloudy from being unfiltered. Initially, the nose perks up thoughts of juicy, not overly sweet fruits, such as melon and honeydew. The beauty of the wine arrives though after the initial taste. You first think of a bone dry Fino Sherry, or at least for me, a similar bone dry, nutty white I sampled recently from the Jura region of France. Then the wine opens up, presenting a hint of cardamom, mingling with plenty of citrus zest, and a much smoother finish than the start. Sampled recently at San Francisco’s superb restaurant Flour + Water, it paired perfectly with an albacore tuna confit with butternut squash and black eyed peas. I could easily see this with a summer tomato salad or even roasted chicken with panzanella, using more of those summer tomatoes. Occhipinti is making headlines from her 30 acres of grapes, at just 29 years old. 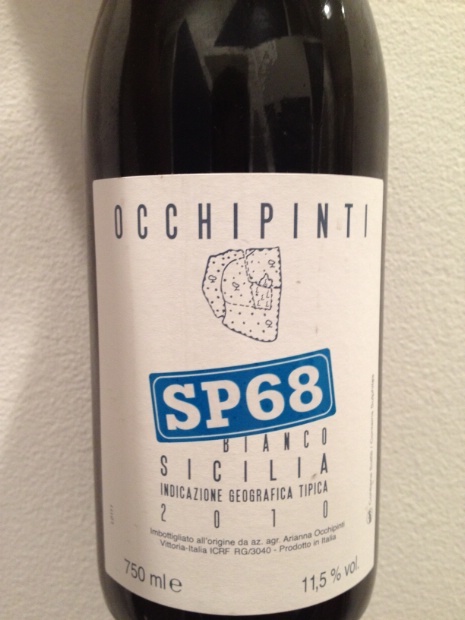 She also makes her own olive oil…which one can only imagine how sensational that would be if the terroir creates wines such as this SP68 Bianco. Crafting riveting wines, Occhipinti soon will be on the short list of in demand wines worldwide. Look out sommeliers everywhere, Sicily is the next Italian wine region in vogue. This entry was posted on August 22, 2012 by trevsbistro. It was filed under Cities .